Goalkickers: J Garlett 5, A. Walker 5, B. Thornton 4, E. Betts 2, C. Judd 2, J. Waite 2, R. Warnock 2, E. Curnow, M. Murphy, M. Robinson & K. Simpson 1. On this significant night for the game in general and the Carlton Football Club in particular, the Navy Blues celebrated captain Chris Judd’s 200th career game in grand style, by demolishing the much-heralded Gold Coast Suns by 119 points at the Gabba. In a hype-filled prelude to the debut of the Suns - the AFL’s 17th team – some commentators saw it as a danger game for Carlton. After all, the new Gold Coast side was packed with potential. They had scooped up the cream of the country’s available junior talent during 2009 and 2010, while recruiting a group of established players from other clubs, including their inaugural captain; 2009 Brownlow Medallist Gary Ablett. Still awaiting the completion of their new stadium at Carrara, the Suns had agreed to play their early matches at the Gabba, and the Queensland capital provided another beautiful warm autumn evening when a responsive crowd of almost 28,000 filled the ground. The novel idea of 20-second count-down to the opening bounce – flashed up on the scoreboard – immediately got the crowd involved. It was the Blueboys however, who exploded off the blocks, and they stamped their authority on the game with five unanswered goals in the first twelve minutes. From then on, the game was a training session for the visitors, who rammed through nine majors in the first quarter, and six in the second to lead by 74 points at the main break. Gold Coast forward Charlie Dixon wrote his name into the history books when he kicked the Suns’ first goal late in the first quarter, and they at least got some system going after half time to post three in a row. To be fair, the Suns’ youngsters – twelve of whom were playing their first senior match – were nervous, and mostly over-awed by a slick, determined Carlton combination that had winners all over the ground. The final margin was a whopping 119 points - our 25th win by 100 or more - in a fitting tribute to Chris Judd in his milestone game. Cheered to the rafters by large, appreciative sections of the crowd, he was chaired off the ground by his team after another dominant performance that surely earned him another three Brownlow votes. Also excellent all night was Jeffery Garlett, who finished the match with five goals after slicing through the Sun’s defence at will. 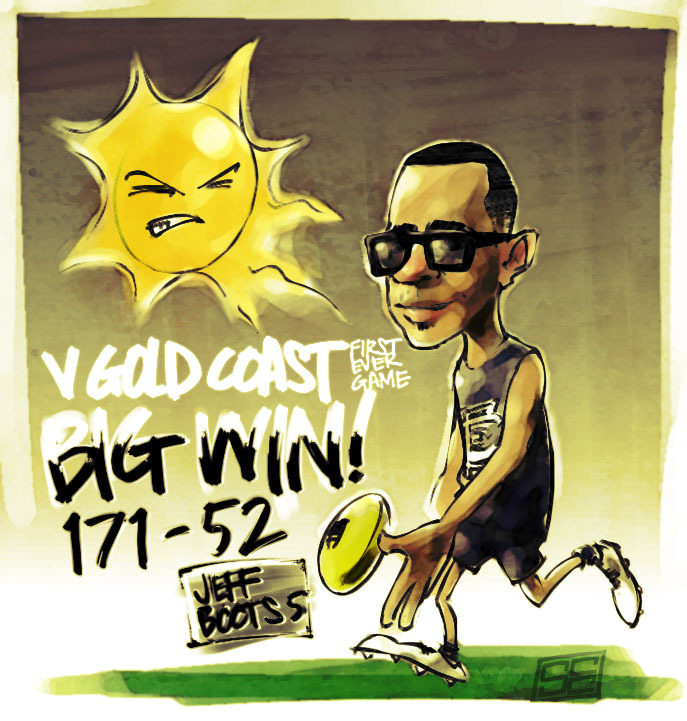 Jeff kicked one of the goals of the year in the first quarter, when he skirted the boundary in the right forward pocket and threaded through a pearler. A bona fide star of the game in his third season, he just gets better week by week. Relishing his new role up forward, Andrew Walker was lively and also booted five goals, while Bret Thornton too, started in attack to stretch the Suns’ defence. He presented well, took some good contested marks and finished with four goals. In the midfield, Marc Murphy built on his super start to the year with another 36 possessions, and Bryce Gibbs cruised around like a vintage Rolls Royce, collecting 36 touches and rarely wasting a kick. Chris Judd helped himself to 29 quality possessions, while second-gamer Ed Curnow stepped up again to gather 26. Playing off half-back, Chris Yarran showed poise and class in probably his best game to date. His 24 collects included three exhilarating dashes downfield, followed by long shots at goal – all of which missed, but boy, it was good to watch! Jeremy Laidler and Nick Duigan were solid in defence, while first-gamer Matthew Watson’s booming left-foot clearing kicks had already started to attract the “woof “ response by the final siren. In Carlton’s only injury concern, Shaun Hampson suffered a corked thigh, and was replaced by Dennis Armfield at three-quarter time. Interesting Fact: 5 goals was a personal best for Andrew Walker, beating a few cases of kicking 3 in a single game. 100 Point wins: This was Carlton's 25th victory by 100 points or more, and the equal 6th best win in our entire history. The last time we celebrated a three-figure win was Round 10, 2001, when the Blues thrashed West Coast at Princes Park, and the margin was exactly the same - 119 points. Round 2 Facts: This was also is the fourth time that Carlton has won by 100-plus points in round 2. The other occasions were 1936 when we destroyed Essendon by 102 points, 1969 (128 points over Hawthorn - still Carlton’s highest score of 30.30.210) and 1985, when St Kilda were hammered by 140 points. The very first time Carlton won by the ton was 100 years ago, in 1911 against St. Kilda. The difference that day was 114 points. % 123.8 202.2 . . . . . . . . . Contributors to this page: molsey , Jarusa , WillowBlue , PatsFitztrick and pblue . Page last modified on Sunday 25 of March, 2018 16:11:30 AEDT by molsey. 1980 Qual. Final - Team List & Selections (pg 2 of 2).